The magazines have arrived . . . but they're under wraps until our party on Friday! magazine, we'd appreciate your RSVP by Wednesday, May 10. Please click here to email us with your RSVP, or call 970-565-7541. NOTE: We will be closed from 5:30 - 6:00 p.m. to prepare for the party. We're doing something special for our May Third Thursday Demo (next week), and it involves you! We will be discussing and showing how we organize our sewing areas and fabric stashes. Bring your best ideas to share and gather new ones from others. 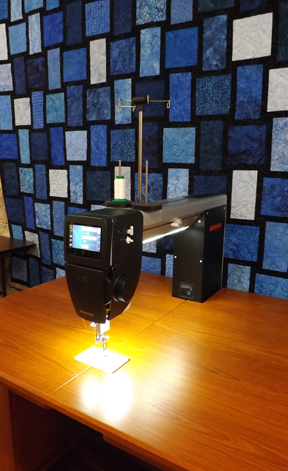 Please take photos of your organization techniques and your sewing area and email them to us no later than Saturday, May 13 at 6 p.m. We'll put together a slide show. When you send photos, please put your full name in the subject line of the email. BONUS . . . take a before and after photo of your sewing room - cleaning and organizing between the two photos - and you'll receive an extra door prize ticket on Demo Day. Here is the final clue for our original mystery quilt - Mystery in the Southwest: A Three-Fabric Throw. Click here to download clue #4. Next week we'll post the final layout of the quilt. 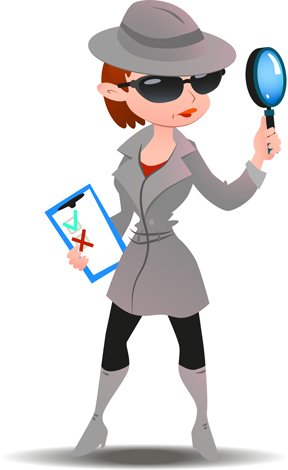 Between now and then, see if you can solve the mystery. Lay out your quilt top as you think it might turn out and send us a photo. If you get it right you'll be honored in next week's newsletter and win a prize. Guest instructor Peggie Buckholts will teach Every Day Every Way – the most versatile tote we’ve seen in a long time. It features deep exterior pockets on the front and back as well as expanded slip pockets on each side to hold keys, sunglasses, magazines, water bottles, and more. Inside organization includes a full-zippered mesh pocket and several additional divided pockets. 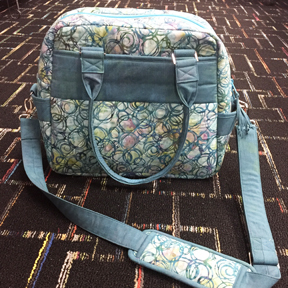 This bag measures 15″ x 12″ and works as a large tote, carry-on bag, or even a diaper bag. The hardware for this tote is very nice quality and Soft & Stable makes it durable and comfortable to carry. Homework REQUIRED: Machine quilting and cutting all pieces. Peggie will be available on Wednesday, May 10 from 9 a.m. – 2:30 p.m. to assist students who would like to do their homework for the class here at the shop. This class is for intermediate and above sewists. 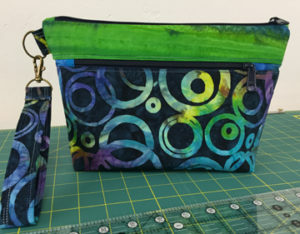 Make the latest Pink San Beach Designs zippered bag in this full-day class that will be taught by Tricia. The Maui Glam Bag is fat quarter-friendly and features two zippers and lots of pockets inside. The strap attached with a swivel D-ring adds interest. Join this fun, three-Saturday knit-a-long and make a pair of magic loop (two at a time) socks. This is not a class, so if you attend you should be familiar with the concept. Either Sue or Anne will be available to help you over any troublesome spots. 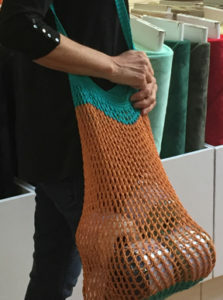 Knit this handy bag to take to the Farmer’s Market and other outdoor events this summer. The expandable bag can be made with cotton, linen or hemp yarns. The first class will be spent getting started. 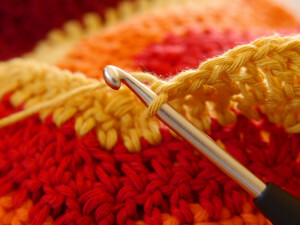 Take the project home and knit the bag the size you want, and come back the following week to knit the handles. Dion and Ann have been working hard and they're pretty well caught up at the moment. 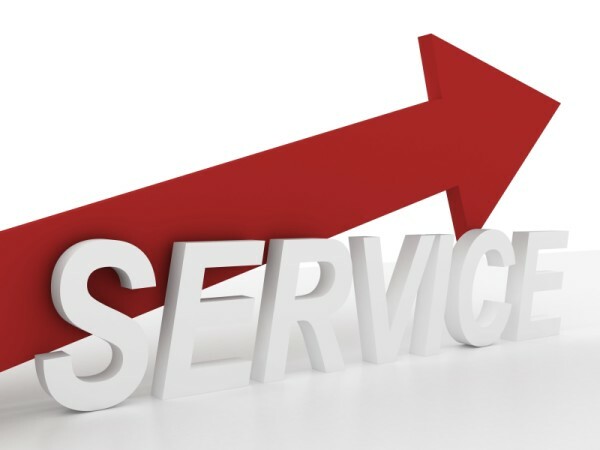 If your machine needs service, bring it in this week for quick turnaround. Also, if you're planning a vacation this summer, consider leaving your machine with us for service while you're away. Regular price: $70. Sale price $52.50. 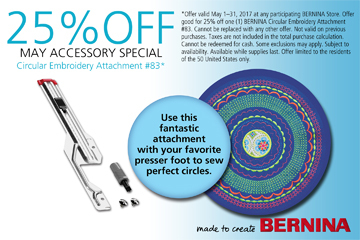 May 18 - 22 take $1,000 off the amazing BERNINA Q20 sit down longarm quilting machine. Come in now to try it out so you'll be ready to make your purchase during the sale. Sixty-month 0% financing will also be available for this machine during the sale. Don't miss out! This week only . . . take 20% off all solid fabrics. Build up your stash with 1/2-yard minimum cuts from our large collection of solids. Kona Cotton, Northcott, Marcus, and more. Offer expires on Saturday, May 13 at 6 p.m. One-half yard minimum cuts. You must mention that you saw this offer in the Quiltzette to receive the discount.